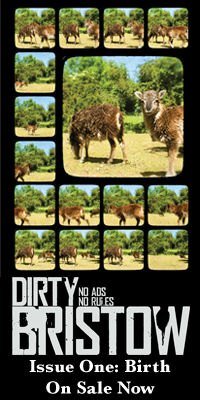 We’ve hundreds and hundreds of copies of Dirty Bristow Issue Two — Beast all ready to go, and this is what it looks like. But what’s actually in there? We asked a few people who, for one reason or another, have seen it for their favourite bits. Danny found his interview with an Otherkin was relatively easy to write but tracking someone down willing to talk to him was in his own words ‘the ballache of the year’. His pick is Tom Lennon’s Mythical beasts of Birmingham. Order online here. It’s also available at a few outlets in Birmingham: Urban Coffee, Nostalgia and Comics and Brewsmiths. Every Olympics, or other merchandisable sporting event, needs two things: a logo that can be moaned about by graphic designers and perhaps looks from certain angles like a popular cartoon character performing an obscene act, pointless sponsorship, corporate fascism, and a mascot. Er, four things. But the mascot is the most important. Who else is going to appear on T-shirts, baseball caps, pens, novelty birth control? Who’s going to keep the not-hugely-interested-in-the-sport crowd entertained during the interminable waits between “heats”? That’s right — the bloke in the costume. Some of our favourite mascots included World Cup 2006’s Goleo or “the pervert lion” and Mexico ’86’s Pique the racially stereotypical jalapeño pepper. And of course the London thing has Crooklock and Manabille. 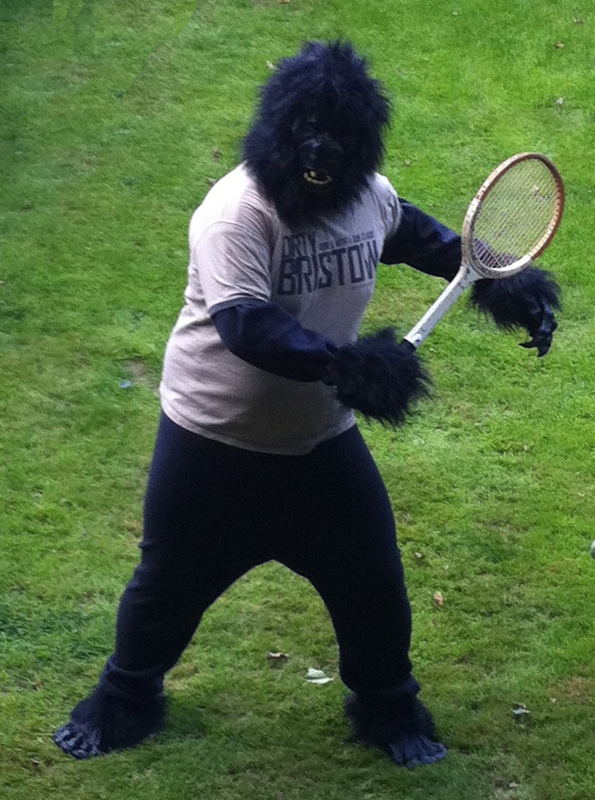 The Bristow-lympics has employed top branding consultancy Boggle, Bogart, Heggertay and Biscuit to come up with ours. But they have decided that for engagement purposes that we hold a competition to come up with a suitable name. 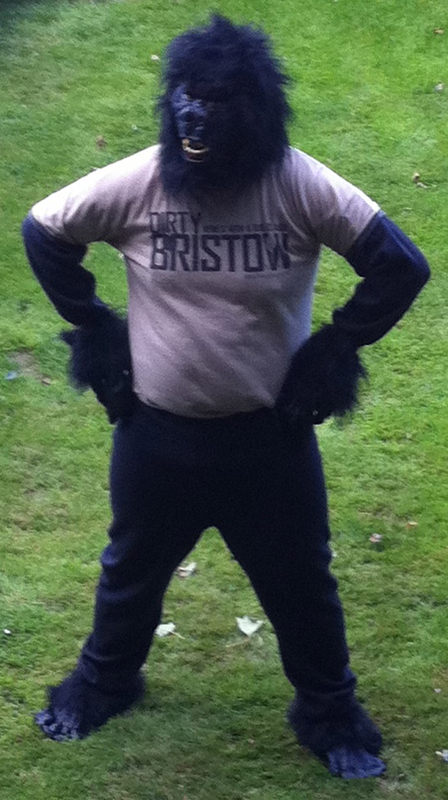 So you can win a special Dirty Bristow prize by naming our apiarian sporting pal. Leave a name here in the comments and we’ll pick the best one. Compo is now closed. Winner will be announced soon. 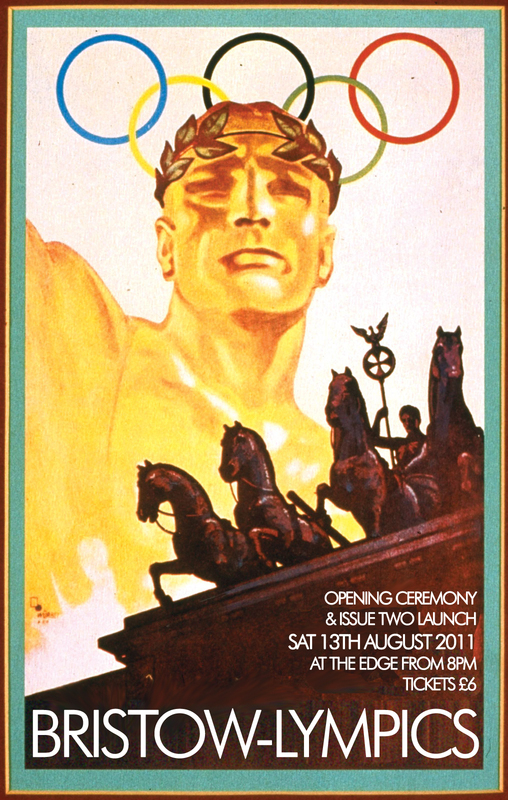 Don’t forget you can see [insert name here] at the Bristow-lympics Opening Ceremony and Issue Two Launch on Saturday 13th Aug at The Edge in Birmingham City Centre. There’s loads more on too, go get yourself a ticket. Apparently ‘10 days’ in Council language actually means ‘10 working days’ and the entertainment and alcohol licence hasn’t come through for the event on the 23rd. Which means we have to move it,: otherwise it’ll just be some people sitting in a room. The line-up may shift a little but still full with all the Friends of Bristow and artists that share our sense of humour, love of music and capacity for a thumping good time. The event is still being held at the Edge, but now will be on Saturday the 13th of August. This means we now have extra time to make the event even more spectacular. We hope that all the people that couldn’t make it now can, and the ones that have already bought tickets will forgive the date change. It also give you a chance to go out there and get your friends to come along. The more support we get for this event ensures the continued existence of our unique magazine and proves to the corporate machine that not everything has to be branded, labeled and sold back with a reality stars smile. If you’re still a-coming, your existing tickets/email etc are vaild — hope to see you then. If not, let us know and we’ll refund your ticket money. The first music I ever owned was a C90 tape with Ray Parker Jnr’s Ghostbusters and Thriller by Micheal Jackson on—I was a little obsessed with ghosts and monsters at the time. My mom picked up an old Walkman from a jumble sale and I listened to them over and over, each time listening to the whole tape just in case there was something else on there. There never was. 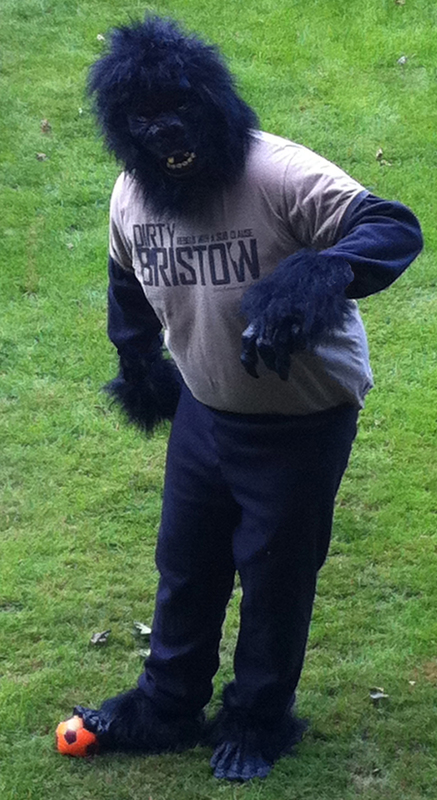 Bristow is many things and exists for reasons other than the vanity of its editors. One of them is exploring a format that while will still survive but has probably seen its seen its glory days as important cultural artifact. One of the funny side effects that the internet has is that it brings together creative types who pick up the old tech that its replaces and allows them to look at it afresh wander ‘what can we use this for?’. Hopefully somebody will do this for the cassette tape: we’re having a bash. The durable tape was a small robust object that played everywhere, as opposed to the flat delicate record. Where every record was valued, dusted and its notes poured over, a cassette was almost disposable function and ubiquitous but by being so endlessly customisable. If you really tired even of a pre-recorded tape you could always fill up the holes on top and press Play and Record. The cassette tape took some of the power back from the record companies. It was the first pirate tech where you could share your favourite songs, make mix tapes and not only own the music but take ownership of it. The quality tended to be a bit hit and miss but, hey, it was coming out of two tiny speakers encased in bright orange cushions while you walked down a busy high street. Of course after this came the the compact disc, a once again delicate, flat, unlock-able platform – unless of course you transferred it to tape. Now the humble tape we’ve attached to the front of our magazine isn’t exactly re-inventing the wheel. It’s more of a homage to the magazines we bought as a kid. But we hope by making some take out their old Walkmans, car stereos or the old clock radio we will spark someone to look again at a the humble tape, a format that shaped our musical tastes, got us through long car journeys with our siblings and sound-tracked our teenage lives. 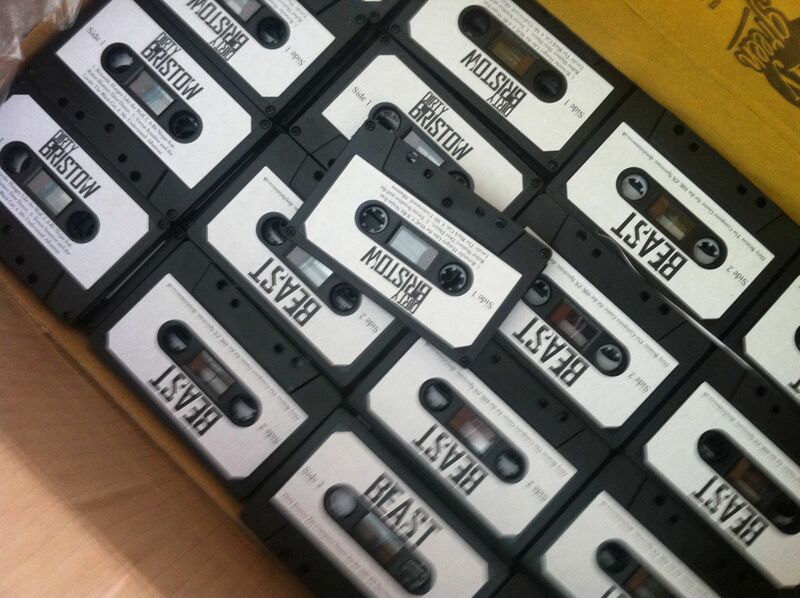 There are 250 copies thats come with this plastic piece of ultra-short term nostalgia, which features four new and exclusive cover versions on the theme of Beast by Birmingham’s most willing musical acts. 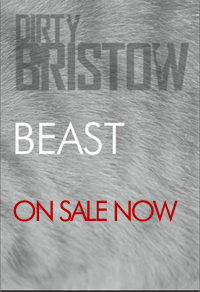 You can go and buy Dirty Bristow Issue Two — Beast here. We’ve hundreds and hundreds of copies of Dirty Bristow Issue Two — Beast all ready to go, and this is what it looks like when flicked past your eyes to a Warren Zeavon tune. (Click and it’ll appear in your shopping cart in the sidebar).